Primary health care providers and behavioral health clinicians work together in one space to meet patients' physical and mental health needs. 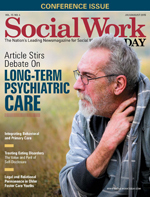 Social workers and most physicians agree there's a connection between behavioral health and physical health. Sixteenth Street Community Health Centers (SSCHC), a group of health clinics that cares for Milwaukee's underserved population, has developed an integrated behavioral health model that fosters conversations between medical providers and mental health team members to better address the linkages. In this integrated model, primary care physicians, social workers, and other behavioral health providers compare the perceived needs of a patient with a goal of meeting those needs together. At SSCHC, behavioral health clinicians practice on the same floor as primary care providers so mental health concerns such as depression, anxiety, suicide avoidance, and alcohol and drug use can be addressed immediately in the course of the patient's primary care physician visit. Bridging the gap between mental health and physical health improves patient care and quality of life. SSCHC began its integrated behavioral health model with teams of primary care physicians and bilingual, bicultural behavioral health clinicians residing on the same floor to quickly address concerns. The health centers started out with an approach that tried only pregenerated appointments, but after some trial and error, we realized patients needed the opportunity for same-day referral. Now, one-half of the behavioral health appointments, or consultations, are preplanned and the other half are determined in real-time based on doctor recommendations. By maintaining open behavioral health appointment slots, medical teams can immediately refer patients experiencing emotional issues, stress, and other emerging mental health concerns. And, by treating behavioral health and physical health on the same floor, members of the behavioral health team are always close at hand to perform a rapid assessment if an emerging mental health issue is identified. We provide supportive social services to assist both patients and their families with crisis intervention, resource referral, and advocacy in areas of pregnancy, children, elders, special needs, family violence, homelessness, and other concerns. After our assessment, a plan of care is established and the appropriate referrals are made to ensure patient care is coordinated. The integrated model provides immediate access to high-quality behavioral health care alongside physical care. If a physician notices mental health issues during an appointment, he or she can inform the behavioral health team down the hall and bring them into the room. This immediacy is key for stemming behavioral health issues. By talking with a social worker or another member of the behavioral health team, a patient can immediately address his or her situation, so it doesn't become a bigger problem. It is important to reach patients right away, to let them know that help is available and to give them hope. For example, one family recently arrived at the clinic for a check-up appointment the morning after an overnight robbery in their home. After hearing about their experience, the primary care physician called for a social worker, and we talked through the situation with the family immediately. This problem-solving approach helps patients emotionally and can prevent lingering behavioral health issues. Physicians are experts in treating the physical wounds from a trauma, and our behavioral health team members lend a hand in providing emotional care for patients who experience various traumas. Mental health staff members often collaborate with other departments to align treatment for mental and physical comorbidities, such as depression and diabetes or ADHD and pediatric care. We work with the whole spectrum of patients, from toddlers to older adults, regarding behavior problems, family trauma, and common mental health issues. The focus is on intervention and relief through a few short sessions, rather than lengthy, complicated appointments many patients fail to attend. By offering behavioral treatment and resources onsite, we help patients begin to make lifestyle changes within the clinic that they can then use at home or at work. For example, we often help diabetic patients with stress management and relaxation therapy, through prescheduled appointments or real-time consultations. By teaching these patients how to better manage their stress, they're less likely to become depressed from the pressures of diabetes. In turn, patients who have increased emotional stability are more in control of themselves and their diabetes, and consequently have an easier time managing the disease. In our integrated care model, we try to individualize appointments as much as possible and effectively use face-to-face time with patients and their families. For instance, we walk parents through their child's ADHD questionnaire in person during their scheduled primary care physician visit. This approach ensures parents read and understand the questionnaire, rather than us sending it home with them after their child's diagnosis, where they can easily lose or forget about it. Focusing on a child's mental health concerns in their primary care visit also fosters conversation about what parents can do in the home to minimize ADHD behavior. Parents receive both a medical and behavioral perspective on how to help their child, and this advice is tailored to each child and his or her family's lifestyle. When working on an interdisciplinary team, clinicians and providers must be flexible. Communication skills and confidentiality savvy are a must. Physicians should know what to share or not share with their behavioral health clinicians, and vice versa, while maintaining an open style of constant communication. Our health centers use electronic medical records (EMRs) to communicate, and in-hall, on-floor consultations between physicians and clinicians are encouraged. The integrated model requires an open culture where the medical team is comfortable connecting with social services, especially if the concern is more about resources than clinical health. Our model of having primary care providers and behavioral health specialists on one floor is key to fostering a culture of open communication. However, even with mental health clinicians close at hand, doctors still need to proactively seek behavioral health help and fundamentally understand how some mental issues might aggravate clinical concerns. The behavioral health team brings a focus on the strengths of the patient to the clinical perspective of prognosis and diagnosis. In an integrated model, there is no need to "medicalize" everything. For example, an elder woman recently came in and her doctor was concerned she was depressed, so he asked for a social worker to talk with her before prescribing anything. We spoke about her strengths, what she likes to do, and what's going on in her life. After finding out she was spending a lot of time traveling across the country to visit her kids and missed her home, we recommended a good dose of more time at home instead of antidepressants. The integrated model allows for social work concepts like "strengths-based perspective" to come into play and helps us identify cases where medication or formal medical treatment like therapy isn't needed. Recommending treatments that are effective yet affordable is especially important for our patient population. Many of the people we care for cannot afford expensive medications or expensive formal therapy sessions, so we often have to take a nonmedical approach and focus on the behaviors and strengths of our patients. According to research by SSCHC and the University of Wisconsin-Milwaukee published in Behavior Therapy in 2014, Latino patients who engaged in counseling or psychotherapy at SSCHC stayed in treatment longer and saw positive changes. The research proves that therapy helps with mental health issues like depression. Additionally, it's always wise to consider nonmedical approaches, as overmedicating is a common concern in the behavioral health sector. Another social work concept built into the integrated behavioral health model is "person-in-the-environment." At SSCHC, we think a lot about how the environment affects our patients—either positively or negatively—and how the environment can help show their strengths. The behavioral health team works with other Sixteenth Street programs, such as Social Services and the Parenting Resource Center, to provide a multidisciplinary team effort to promote family wellness. For parents struggling with behavioral problems, we plan how they can spend time with their kids in a natural environment—their home—so the children are not acting out to get their parents' attention. It's crucial to understand how an environment can affect a patient and how the home can shape a child. Physical and mental health often overlaps with a patient's environment. In SSCHC's Latino community, for example, many patients have diabetes. Yet, it can be harder to make lifestyle or diet changes, because eating together and cooking for the entire family are highly valued in this culture. It's very difficult and emotional to make changes that compromise culture, so our culturally intelligent staff is a huge asset. We understand patients' different environments and work with whatever they bring to the table. That's why our behavioral health team is made up of psychiatrists, psychologists, and family therapists who provide a full range of outpatient mental health services in both Spanish and English. Bilingual and bicultural clinicians allow health care organizations to build bridges with a patient population they otherwise wouldn't have been able to reach as effectively. SSCHC also engages in community projects to be more in tune with, and often to improve, our patients' environment. These programs work to address social determinants of health by creating social and physical environments that promote good health for all. For example, through our Healthy Choices program we advocate for more healthful options at local supermarkets. Staff members also are involved in a local river improvement initiative where they help to clean the riverway to physically improve the environment of the neighborhood. The environment in which we counsel people with behavioral health issues also helps reduce the stigma of mental illness. In 2014, SSCHC conducted more than 21,000 individual mental health sessions within its clinics. In our integrated model, patients feel as if they're at their medical doctor's office even though they're talking to a therapist, counselor, or social worker. By talking in a medical setting, patients don't feel the fear or pressure often associated with going to see a therapist. There are no concerns over making a "mental health" appointment through the real-time, doctor-recommended consultation approach. Through the integrated model, patients react more favorably to the personal recommendation and introduction to a behavioral health colleague in the same room as their primary physician. Patients also don't need to leave the building or schedule a separate mental health visit that might draw judgment from friends or family. We've found that this convenience and immediacy also helps with treatment follow-through. By integrating behavioral health care with physical care, we can reach people who may not have sought behavioral health treatment because of the associated stigma. By practicing in integrated teams on the same floor, primary care physicians and behavioral health clinicians are able to more quickly address concerns. Patients receive mental health evaluations and care faster, without the months of waiting common in many facilities, which often leads people to give up trying to get care for behavioral health issues. In just a three-month period, our social services staff made 6,000 follow-up phone calls, conducted 2,000 appointments, and received in excess of 3,500 walk-ins. The breadth of our program is reflected in our high rate of walk-ins, which is a result of our efforts to provide open access and comprehensive services. With the access to behavioral health care readily available, we're able to see more people and provide more appointments. A robust EMR system allows for more effective tracking of outcome measures specific to behavioral health. For example, the behavioral health team is able to determine severity level and track improvements over time. This helps in making clinical decisions regarding patient progress toward treatment goals. We also use our EMR system to generate reports on clinical metrics, such as which diagnoses are most common. These reports determine what new programs may be beneficial based on what problems are most prevalent for the patient population. The integrated behavioral health model enables more people to get the care they need and prevents behavioral health issues from progressing into something patients may need medication or formal therapy to treat. Soon, SSCHC will be able to provide access to integrated behavioral health services for even more people in our community. Through a $1 million grant from the Aurora Health Care Better Together Fund, we'll be able to expand capacity and further increase the community's access to quality primary care and quality behavioral health care. We hope to add new psychologists, social workers, and advanced practice nurse prescribers to our growing team. Whether you're just beginning to create your own integrated model or are already looking to expand an existing approach, behavior health professionals must continue to bridge the gap between mental and physical health to increase access to behavioral health services and improve patient care. — Gabriela Dieguez, MSW, LCSW, is a clinical social worker and bilingual therapist at Sixteenth Street Community Health Centers in Milwaukee.